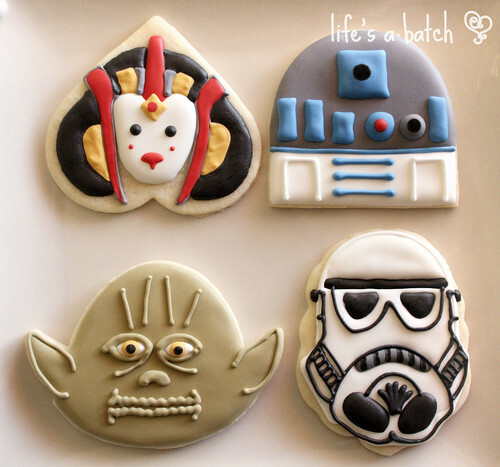 May the 4th be with you, in cookies! Every year, I bless my friends, “May the 4th be with you.” Every year. 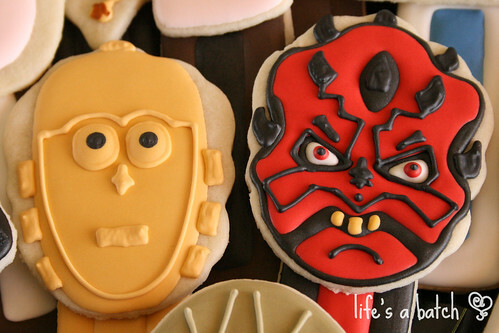 But last year, I went one further, and decided to do that with cookies for one of Jack’s special neighborhood friends who was celebrating a birthday. When it comes to Star Wars, my boys have had LOTS of toys over the years. However, one of the very easiest to replicate, I thought, were their special PEZ dispensers. 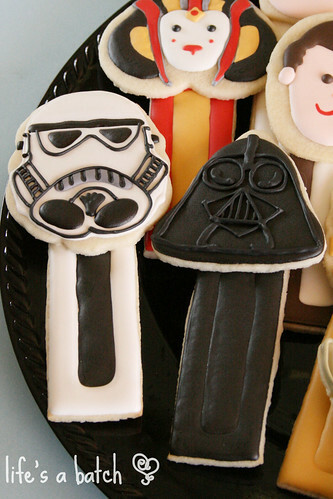 Well, let’s just say that the cookies were made, and that the PEZ part was easy… but the rest? Not-so-much, haha! 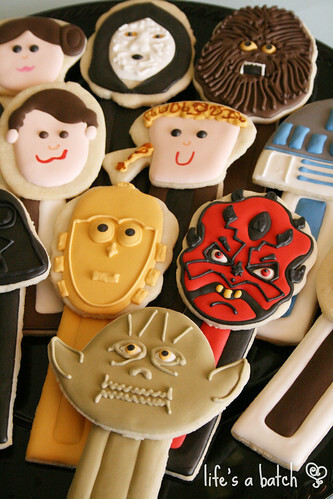 Now, I’m not going to highlight most of the people cookies because, let’s be honest – they’re awful. Do you ever look back at older work & shudder, wondering just WHAT you were thinking?! 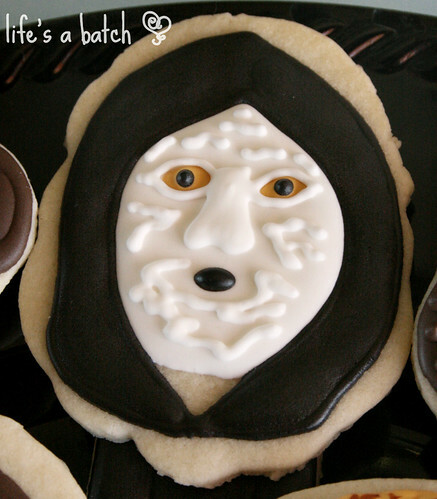 That’s these cookies for me. However, I’m pleased (still) with a few of them. Yoda, even though he really doesn’t fit that shape well, I suppose. Still, you know exactly who he’s supposed to be, right? Right. And this is the only image with a good angle of little R-2D2 I have. See? 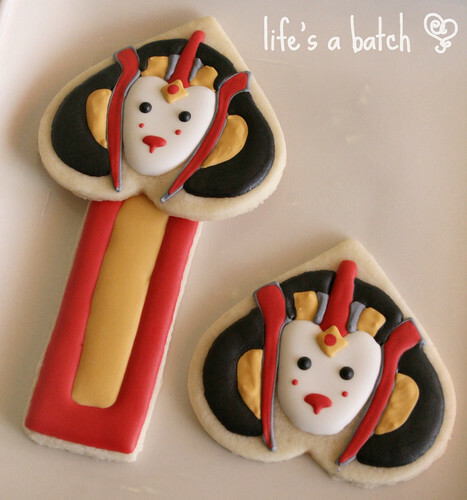 But like I mentioned above, Queen Amidala is my very favorite! Why? Well, I think she just *works* on that heart shape, and it doesn’t require a stretch of the imagination at all. Plus, she just looks so pristine, ya know? I love that. One of these days, I’ll re-do her, and I’ll use the proper consistency of icings for each portion, etc. 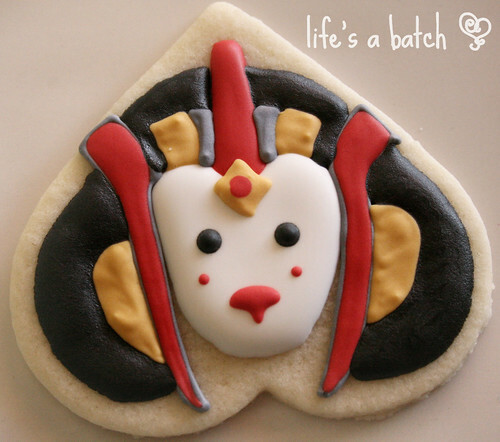 But for quick cookies for Jack’s friend, I think she turned out pretty well! To construct the PEZ dispensers, simply ice the template shape above in sections, to add the dimension of the handle. In some cases, I used the same color for both areas, and in others, I used tone-on-tone for a different look (C-3PO vs Darth Maul, for example). 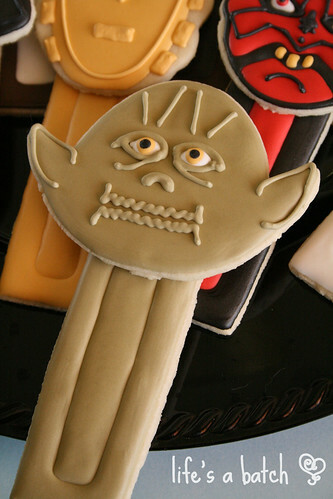 Ice the cookie “heads” separately, and once both the handle and the head are dry, “glue” them together with a bit of stiff royal icing & let dry completely. Easy! 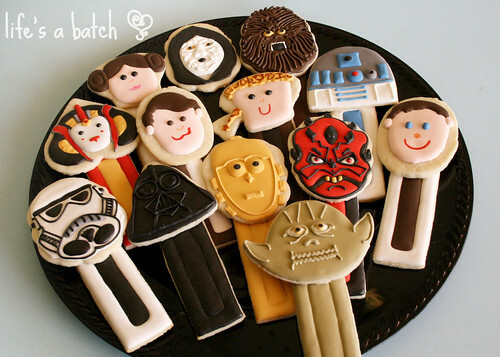 These are wonderful and the Pez dispensers…awesome idea! Thank you so much, Paula!